Imagine days spent in delight as you soak in the views of soft, sandy beachfront, rugged mountains, and the deep blues of Osoyoos Lake. Sit on our poolside patio and savor the smoky aromas and tangy flavors from our outdoor BBQ chef. Take a stroll along the lake. Submerge yourself in a hot tub, the steam room, or swimming pool. Splash in Canada’s warmest lake. The Restaurant at Watermark and Poolside Patio will introduce you to the many culinary possibilities produced by local farmers and vintners, ensuring a delicious, healthy and unforgettable experience. 24 hour Gym, full-service Wellness Spa, Yoga, Pilates and TRX Studio, Cycling Shop with rentals and repairs, Conference Centre, BBQ’s, fully-licensed Pool Deck, full-service, award-winning Restaurant and Poolside Patio, preferred pricing for golf, cycling and wine touring. Whatever you feel like doing, the amazing amenities at Watermark Beach Resort ensures that no matter what, you will find your oasis exactly how you want it, when you want it. The best part? It’s all yours! Here at Watermark Beach Resort, your vacation property makes you part of a community of over 100 families and couples that call the resort their second home. Located on the shores of Osoyoos Lake. There is so much to see and do at Watermark Beach Resort. Whether you choose to do everything or simply nothing at all, the full-service resort and amenities are designed to enhance your vacation experience. Watermark Beach Resort is in the middle of everywhere. 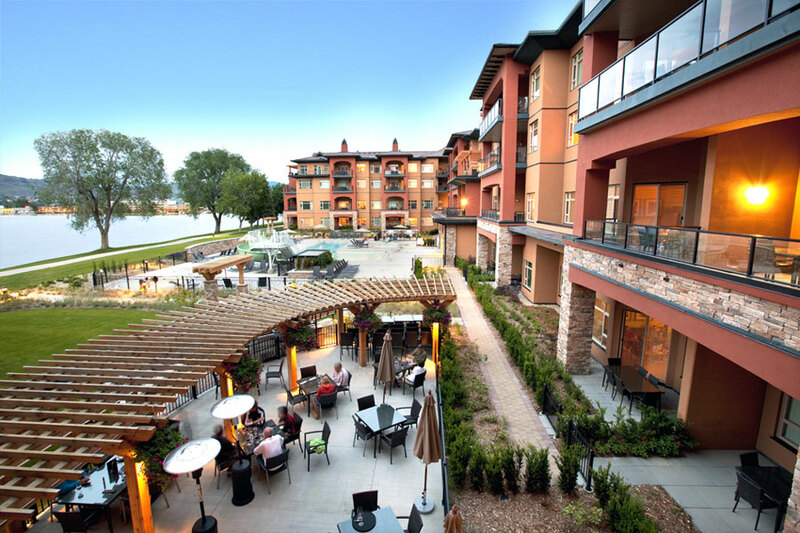 Set alongside the sandy shores of Osoyoos Lake, Watermark Beach Resort is situated in the heart of Osoyoos BC. The resort hotel is located where Main Street meets the warm waters of Osoyoos Lake. At our doorstep you will find cafes, restaurants, shops, boutiques, banks, a grocery store, a liquor store and more. This means you can park your car in our secure underground parking and enjoy our town on foot. Our ideal location is perfect for nature-enthusiasts, too. Lakefront walking trails are adjacent to our resort and make for the perfect morning run or evening stroll. Watermark Beach Resort is classified as a Walker’s Paradise. Providing a knowledgeable and professional ownership experience, Watermark Beach Resort is now offering unique fractional & full ownership opportunities. Watermark Hospitality, & MCL Real Estate have teamed up to ensure every aspect of your vacation property, from purchase to management, exceeds your expectations. As a true four-season playground, Osoyoos provides all the ingredients you need to create a fabulous vacation anytime you visit. Watermark Beach Resort puts you in the heart of the town of Osoyoos, where you will find everything you need within walking distance. Osoyoos is known for its interesting boutiques and shopping, in addition to the walkability to restaurants and pubs.